Innovative Dentists of Houston (Houston) - Book Appointment Online! 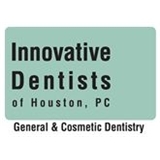 Established in 2007, Innovative Dentists of Houston has built a great reputation as being a warm, friendly office that provides cosmetic and general dentistry services to the Heights and downtown Houston community. The staff are well-loved by patients; their goal is to offer each patient personalized care and make people feel like they’re a part of the family. They always take great care of me. I lost a crown and had to have an emergency root canal while out of town. They were able to see me right away for a follow up visit and getting all of the temporary stuff turned into permanent stuff. I love their staff.